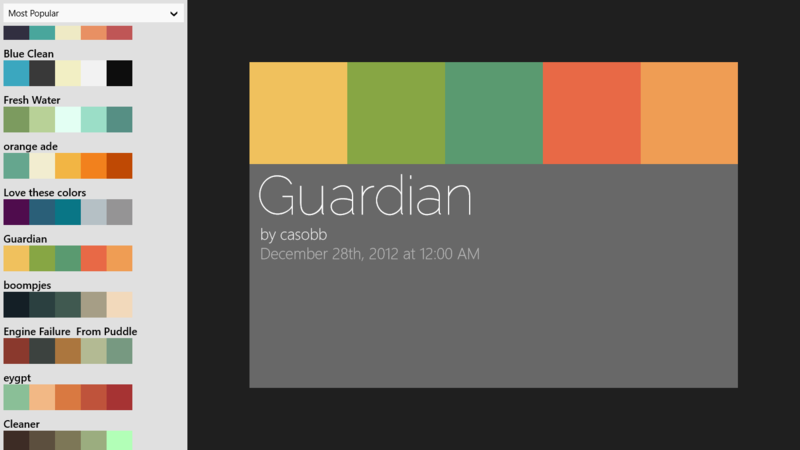 I really wanted to focus on UI for my next Windows 8 app. I’ve got the C# down quite well so I wanted to make a good looking app with XAML. I knew about Adobe Kuler from previous experience with the site and I thought what a great way to focus on UI with an app about colours. Adobe Kuler, for those who don’t know, is a website and API that lets users create and share colour swatches. These could be used for whatever, making themes for your own project or inspiration for a wallpaper etc. My Windows 8 app plans to emulate the features of the website, letting you view the newest, most popular or random themes people in the community have created. You’ll be able to copy the hex colour or RGB values to use for your own. I’m hoping to have a colour editor in the app, so you can create your own themes or edit others, we’ll see how difficult that is to implement. I want it to have Windows 8 charm features like search and share too. Should be a fun project.